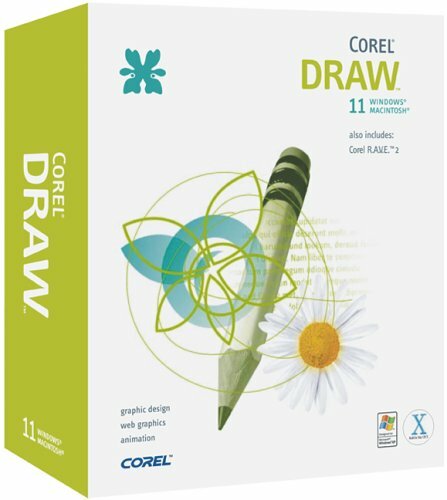 Featuring more than 15 years of continual enhancements, CorelDRAW 11 delivers graphic design and vector animation software for print and the Web. Unique interactive tools distinguish this program, saving you time and making the design process easier. For example, new 3-Point Ellipse, Rectangle, and Curve tools let you create and position shapes in two clicks. Apply artistic effects to blocks of text and maintain formatting with the new Convert to Curves tool. Plus, create lines and curves in one stroke using the new Polyline tool. With enhanced compatibility, a customizable workspace, and professional output capabilities, CorelDRAW 11 makes your work more enjoyable. Corel Draw comes with Corel R.A.V.E. 2 which retails at around £30. "A market-leading solution doesn't become a bad choice overnight and there's still a vast amount of power in the CorelDRAW Graphics Suite box"
"Three solid applications in one excellent package, CorelDRAW Graphics Suite 11 brings enough new features to the table to challenge its illustrious rivals"